If you need any further information please contact the Admissions Team on 0113 222 4414. By law children must start school from the beginning of the school term after their fifth birthday. In Leeds children normally start school at the beginning of the academic year in which they have their fifth birthday. If you have not been offered a place at the school you have requested you can appeal against the refusal. St Margaret's appeals are arranged by Leeds City Council's Admissions team, please download the Admission appeal form from the documents section on the Leeds City Council webpage http://www.leeds.gov.uk/residents/Pages/Admissions-Appeals.aspx and return it to the Admissions team at the address which is on the form. Harry and Polly visit the Nurseries! Harry and Polly went along on the Nursery Visits to meet the new children. They helped to tell the new children about all of the fun things that happen at school! If we are able to offer you a place, you will receive a letter confirming this. If we are unable to offer you a place the Admissions Team will contact you in writing to let you know about the other schools in your area and any vacancies at these schools. To complete if your child would like to transfer schools mid year. 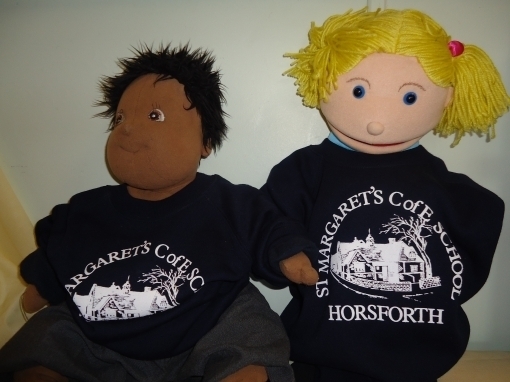 St Margaret's is a Voluntary Controlled school, not Voluntary Aided. This means that Leeds City Council deal with our Reception class admissions.